View Cart “Secrets of the Millionaire Inside” has been added to your cart. SKU: 9780692008284. Category: Business. Tags: Business, competitive advantage, marketing. Why should I do business with you… and not your competitor? The good news is that you can overcome these costly mistakes – by identifying your competitive advantages and creating new ones. 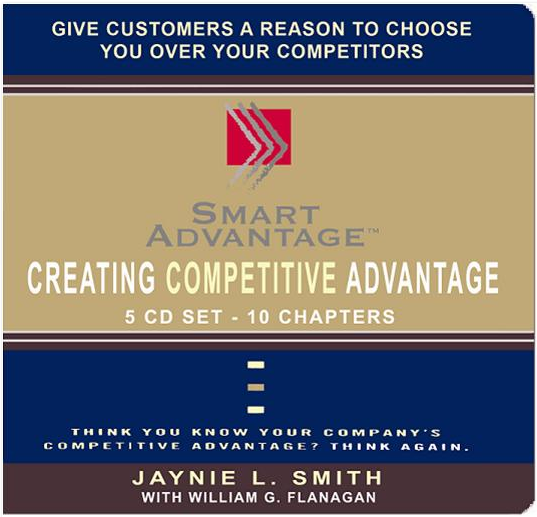 Consultant, public speaker, and competitive advantage expert Jaynie Smith will show you how scores of small and large companies substantially increased their sales by focusing on their competitive advantages. When advising a CEO frustrated by his salespeople’s inability to close deals, Smith discovered that his company stayed on schedule 95 percent of the time – an achievement no one else in his industry could claim. By touting this and other competitive advantages to customers, closing rates increased by 30 percent—and so did company revenues.